More than 230 students from five school districts in the greater Houston area had the chance to meet with over 25 exhibitors and construction professionals representing various trades, including United Tool and Fastener’s (UTF) Safety Specialist, Charlie Gertson. Gertson demonstrated various harnesses, safety hats and tethering devices in addition to allowing students the chance to be tethered and hoisted into the air as they will be on a construction site. “There were 26 hiring companies and associations represented, including general contractors and specialty contractors from a variety of trades. Trades represented included mechanical, masonry, electrical, interiors, roofing and waterproofing, concrete, and scaffolding,” explained C3 Associate Director, Angela Robbins. The special event enabled students from greater Houston area high schools to learn more about careers in construction. According to Construction Career Collaborative (C3), the career fair specifically aims to pair trained and employable high school seniors who have enrolled in Career and Technical Education Programs with companies in the construction industry. 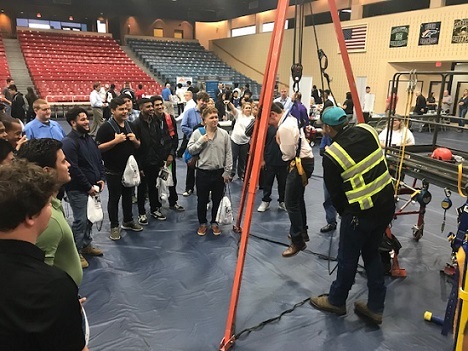 At the career fair, students were able to test and learn about various tools and trades, speak with various potential employers, and learn about safety and fall protection while watching or being hoisted in the air by UTF’s Charlie Gertson. Creating a labor pool pipeline in the industry creates sustainability into the workforce, part of C3’s mission. “Events like this grow the pipeline by introducing construction as a viable, lifelong career pursuit to those who otherwise might never choose our industry,” Robbins explained. “We have to change the perception of students and parents regarding the industry as a career choice. Events like this give us the opportunity to speak with students and councilors to educate them about college not being the only career choice for a viable future." The C3 career fair had students attend from Aldine, Lamar, Alvin, Alief, and Spring Branch areas. UTF has also participated in the Texas Construction Career Initiative (TCCI) High School Construction Career Day at the Freeman Coliseum Expo Hall in San Antonio by giving students hands-on presentations about construction safety from UTF Safety Specialist, Charlie Gertson. The TCCI career day on April 11, 2018 enabled more than 600 students from at least 32 schools in the greater San Antonio area to meet with over 50 exhibitors and professionals representing various trades.